I am beginning to collaborate with a longtime friend, composer and Radford University professor. I designed the artwork for his latest CD. You can listen to it here. Stay tuned for more jazz/collage/poetry collaborations involving Dr. Christopher White and myself. “Music is the art of painting sound upon time.” That is the phrase I use often to describe to my students the interconnectedness of my chosen form of expression with visual art. While clearly both are unique vehicles for peering into the human condition there does exist a symbiotic relationship between the two. While visual art exists as a static moment that captures a mood, feeling or event music creates upon time itself – drawing us into that brief moment with a feelingful sharing of self. There exists a responsibility for all involved, regardless of medium, to fully engage the artistic work, to reflect, to ponder and to be, if only briefly, transformed by the experience. With the addition of poetry one can experience the trinity of expression beyond mere words. Art – Music – Poetry, defying the confines of discursive thought to reach man’s inner feelings: feelings unique to each individual yet able to be shared in community through these arts. 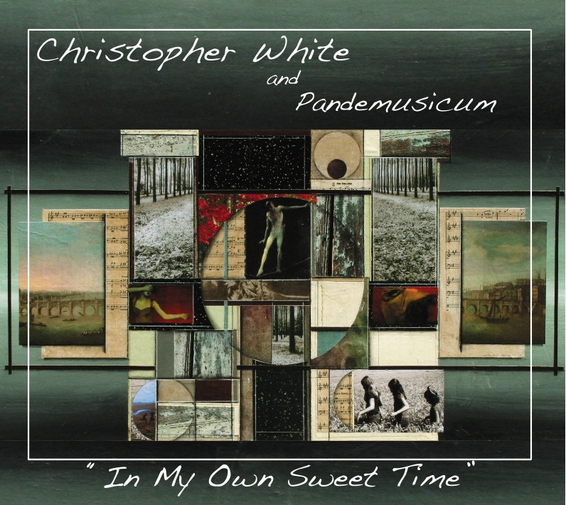 The choice of collage for the cover of “In My Own Sweet Time” is particularly apropos as the album itself is a collection of impressions, and images. Though not a snapshot of any particular moment, nor a working of common musical material, the collection works as a singular entity – a pastiche of feelings – that attempts to capture an essential character of the women represented. Connected as it is, by inspiration rather than musical motive, the album itself is a collage; diverse sound images that create an overview of some who have had great impact upon me and are essential in my life. That this artist, Sarah Bean, would be selected to visually represent such a work is natural. The musical compositions represent two distinct periods of my life, both of which Ms. Bean was present. Six of the works were composed in Maine while she was one of my students; the other four written here in Virginia where fate brought us together once again – this time with her as a professional artist. Her work for this piece captures not only the sense of the musical works in image, it also creates a narrative of my processes. Born in Northern California, Christopher White grew up in small town America where he found musical success early, playing his first professional gig at age 10. An eclectic musician, he studied conducting, saxophone and composition while performing in the studios and club scenes of Los Angeles. His education and teaching career have led him across the country: California to Kansas, Baton Rouge to Boston, Montana to Maine, and finally to his home in Virginia. Along the way he has conducted and soloed with orchestras, bands and jazz ensembles from coast to coast. He has instructed every level of music from pre-school to doctoral students and performed with such diverse musicians as the Stan Kenton Orchestra, Ringling Brothers Circus, Whitney Houston, Ben E. King, Richie Cole as well as the Baton Rouge and Billings Symphonies and Los Angeles Philharmonic Institute. Popular as a clinician and dedicated to education, he continues to perform and compose extensively. He holds degrees from Kansas State University (Ph.D), University of Louisiana-Lafayette (MM) and California State University-Northridge. 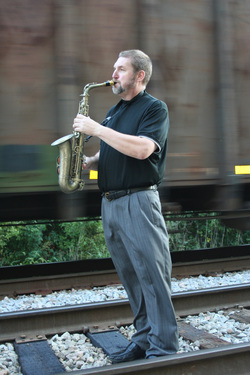 Dr. White is the Director of Jazz Studies and Instructor of Saxophone at Radford University, Radford, Virginia. Christopher is a recording artist for the Artists Recording Collective (ARC) label. How does one approach a collaboration between music; an art form made solely from sound which exists only for a period of time, and collage; an art form that is completely silent and exists constantly until it is physically destroyed? Music, which can exist entirely without physical matter, and collage, which is nothing at all if it is not physical matter? Are these divergent art forms opposite from one another, and if so, how can they be seduced into co-operating. The jazz compositions that are presented on the album, “In My Own Sweet Time” have rich images, shapes, and textures. Each of the pieces is inspired by a person or a place, most of which I have personal knowledge of. Is that the material on which to base a visual representation of the work? I don't believe so. I think that to take music and try to turn it into a language, to make it a literal portrait is to steal from it what makes it special. This is to force music into a box that makes of it a mere illustration. What I did instead was find what music and collage have in common: intensity of emotion, mystery, and beauty. The piece which I created calls on these three elements, it attempts to convey them silently and to build them from physical matter. Contributing to them what they cannot give themselves in the impermanent world of sound. I listened to the compositions countless times, I made dozens of sketches I never used, I started and practiced and restarted again, and I discovered that I was approaching the same process that Dr. White had first taught me more than 15 years ago when he was training me as a musician. I was trying to understand what the music was trying to say, I was trying to understand what tools and skills I had to say it with, and I was practicing over and again, until I could technically give birth to what I saw and heard. This collage is the first I have ever made that came entirely from a trained instinct. That same instinct that musicians use when they improvise and play, what composers use when they write, and what tightrope walkers use to prevent the fall. It is not only mind, and heart and soul, it is also a practiced way of imagining and seeing and remembering what you knew all along.